First of all, I have to say a HUGE thank you to you all for all the kind words about our recent kitchen renovation. 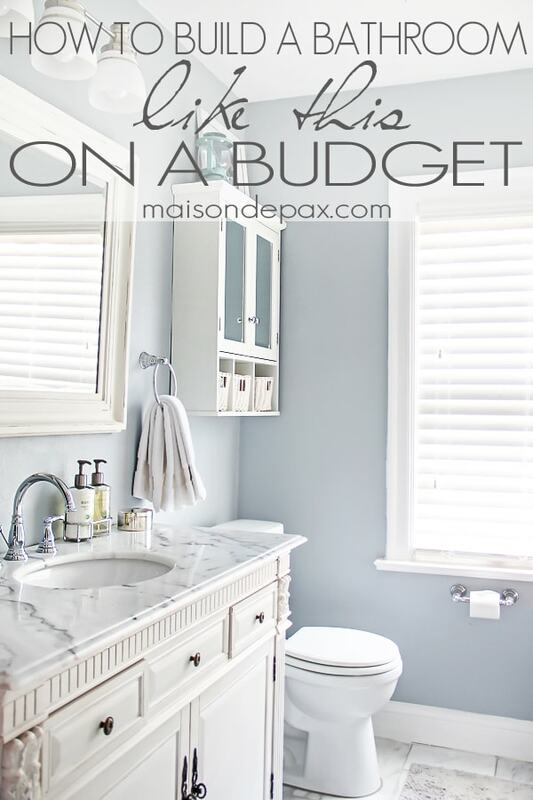 One of my most popular posts ever was 5 Budgeting Tips for a Bathroom Renovation, so I thought it was only fair to share a similar post for our recent kitchen. Before I begin, let me remind you that we had planned a massive gut job reno, thinking we would be in this home for years to come…. and then plans changed (as they often do), and we are now about to move. So, as usual, we adapted and came up with plan B: budget-friendly facelift to sell the house. First, we didn’t want to skimp because we want to pass on a quality home to those who come after us (we LOVE this house! ), but we obviously wanted to keep a reasonable budget because we won’t be enjoying the renovation ourselves for very long. Second, we were in a rush. We started the renovation the same week Mr Pax started his new job in a new city. Three hours from us. We were not interested in dragging this out, to say the least. I’ve got all the details here. 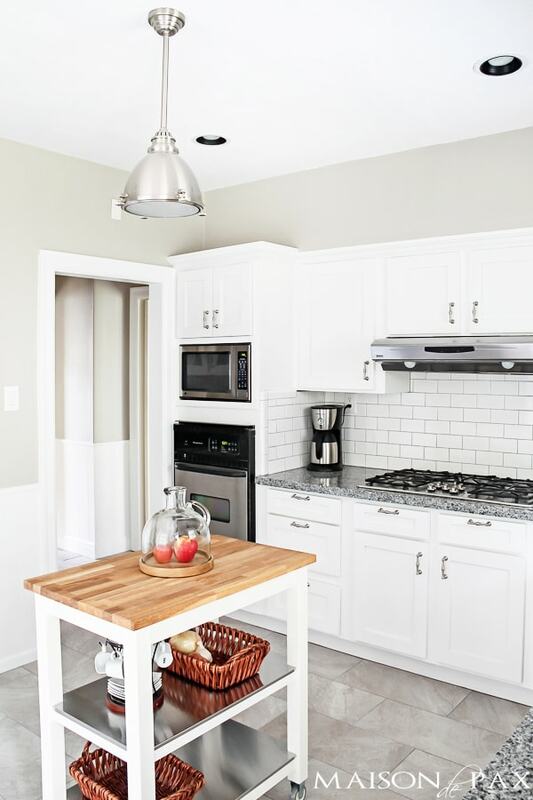 New cabinetry is a HUGE cost, so if you can simply reface even some of your existing cabinetry, it’s worth it. #2. Look for stock, basic updates you can make. Remember the before? Our previous pantry door was a louvered bifold mess. Thankfully, it is a standard sized opening, so for $32, we were able to get a new, basic door from the local big box store. A couple of hinges and a new handle, and we were set. #3. Shop porcelain floor tiles. I cannot tell you how impressed I am lately by some of the gorgeous porcelain tiles out there. We used these, and everyone keeps asking if our floors are marble. I also love that they come in 12×24 – I think it gives it a more upscale look and lengthens the room at the same time. 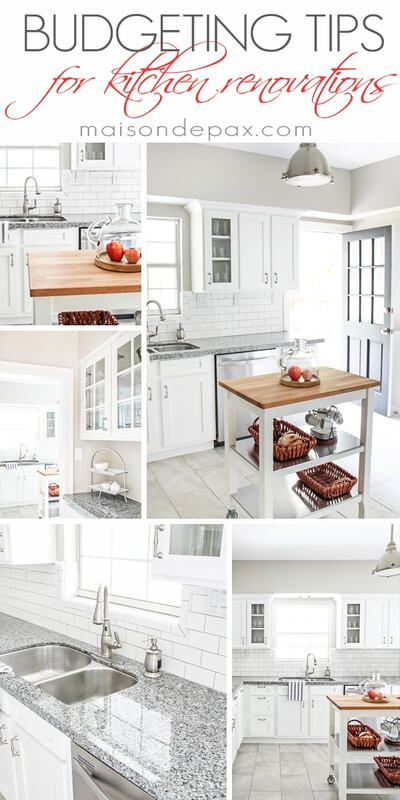 I know it’s not for everyone, but white subway tile is such a beautiful, classic look. And do you have any idea how affordable it is? All the fancy glass, marble, or mosaic backsplash tiles I like were at least $11/sf. Subway tiles are less than $2/sf. 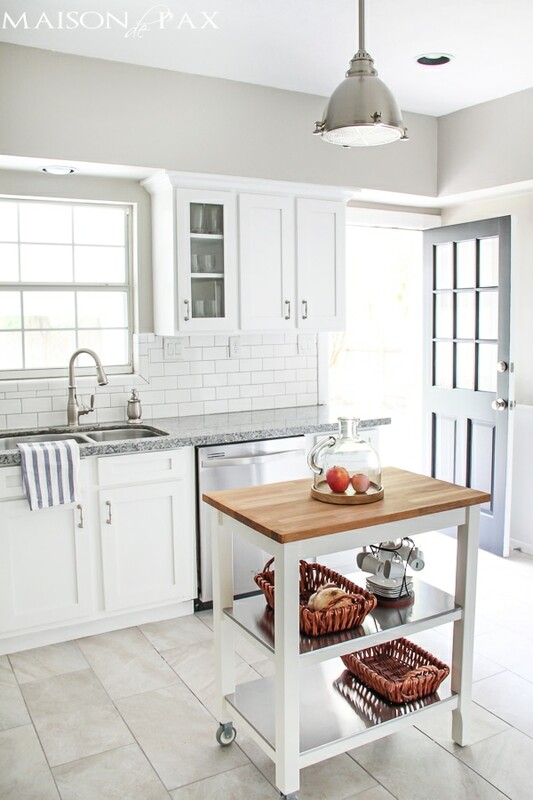 And with a gray grout, I think they are both interesting and classic… Win. #5. Shop online for hardware. There are plenty of things that I need to touch and feel before I buy, but there are some amazing hardware options online – more selection and more affordable than most hardware stores. I used these for my kitchen, and they have a similar look to several high-end styles, but at $2.49 each, they were a great option. #6. Build in your appliances. Our fridge was originally just tucked in the corner (remember? ), and it looked unfinished. It may not be a true built-in subzero fridge, but this is a huge improvement. It gives the whole kitchen a more custom look. 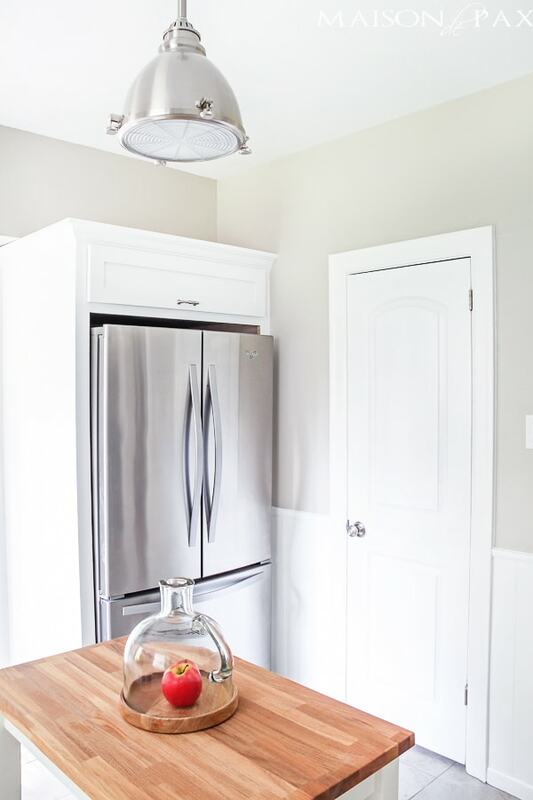 If you already have carpenters doing any part of your remodel, get a price for building a fridge cabinet; you might be surprised. Or if you’re brave (and have more time than we did), a simple frame with some crown molding and baseboard is an awesome DIY project and even more affordable. #7. Find an affordable, portable island. A built in, custom island can cost a LOT. But there are so many affordable portable islands out there these days (I’ve rounded up a ton for you here – all available online!). 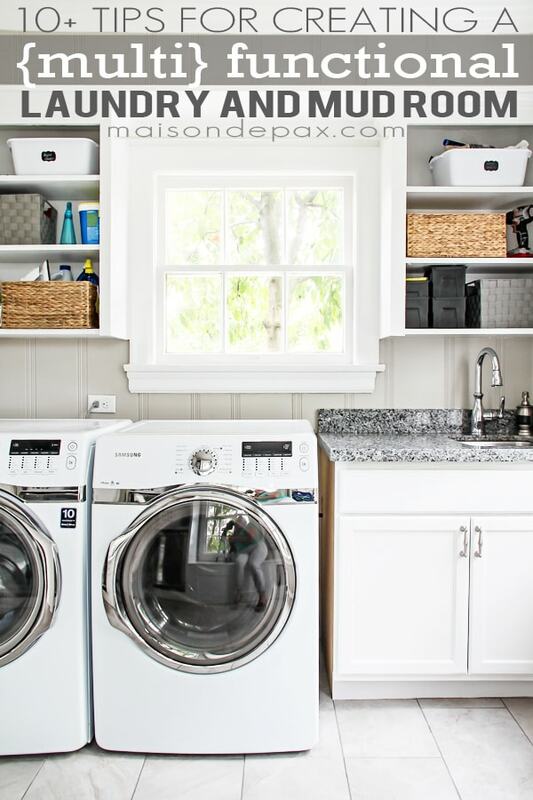 They provide counter and storage space, look gorgeous, and make cleaning a breeze. It works wonders… We painted everything, and I mean everything. 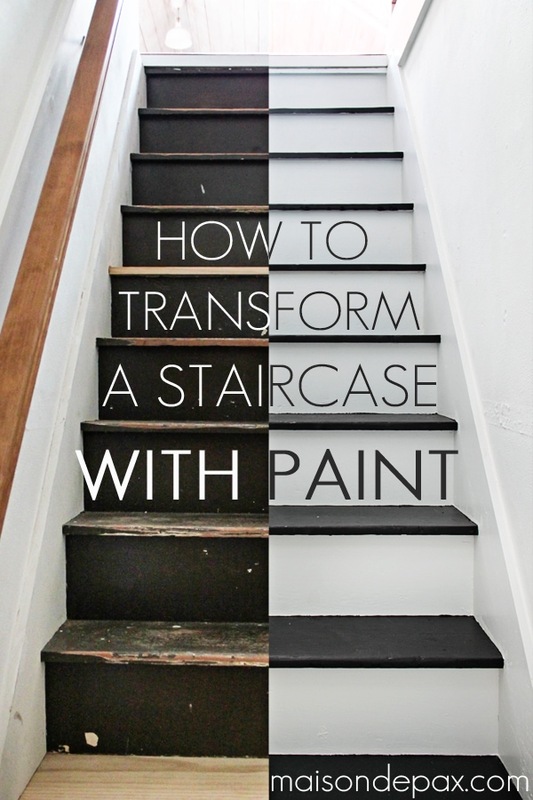 Get the full source list and paint colors here. #9. 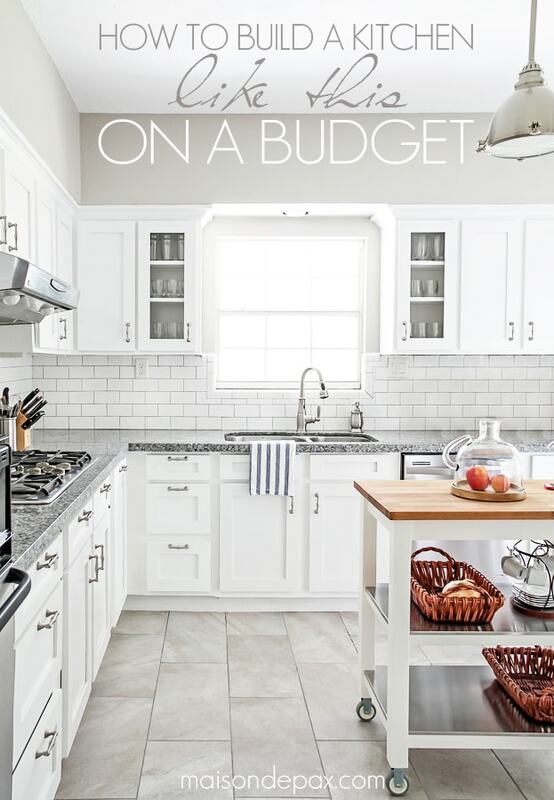 Balance each splurge with a budget buy. Case in point: our faucet and our light fixture. This beautiful faucet has all sorts of bells and whistles, but this light fixture was a basic Home Depot buy. Both are lovely, and they coordinate so well, but we didn’t need both to be extravagant. There may be some items that you just have to have a particular brand or style… and there are others that have some flexibility. In our case, I had two requirements for our dishwasher: stainless and hidden controls. This dishwasher by Whirlpool happened to be on sale at the time I was looking, and it has been perfect. #11. 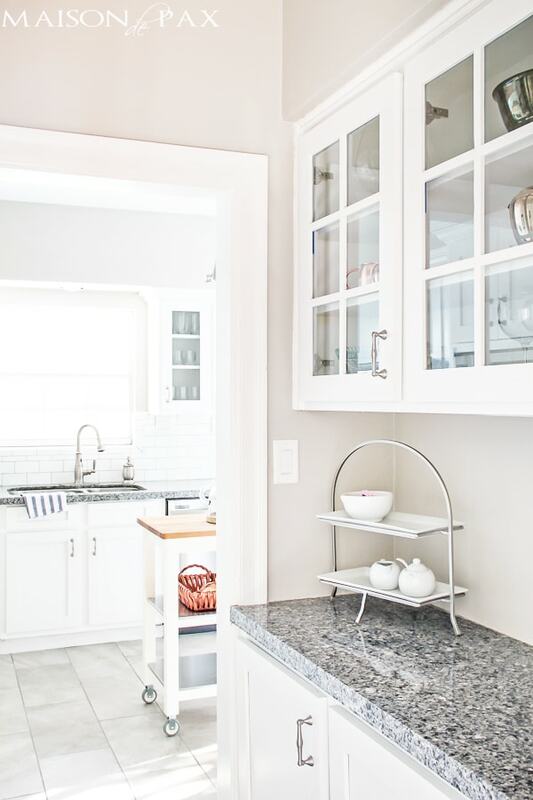 Consider countertops by color palette. My dream countertop (and everyone else’s these days)? Marble. Budget friendly? Not so much… But I knew that I wanted something in the gray family, and though our choice doesn’t have the look of marble, it does keep the overall color palette in the kitchen on the gray scale. 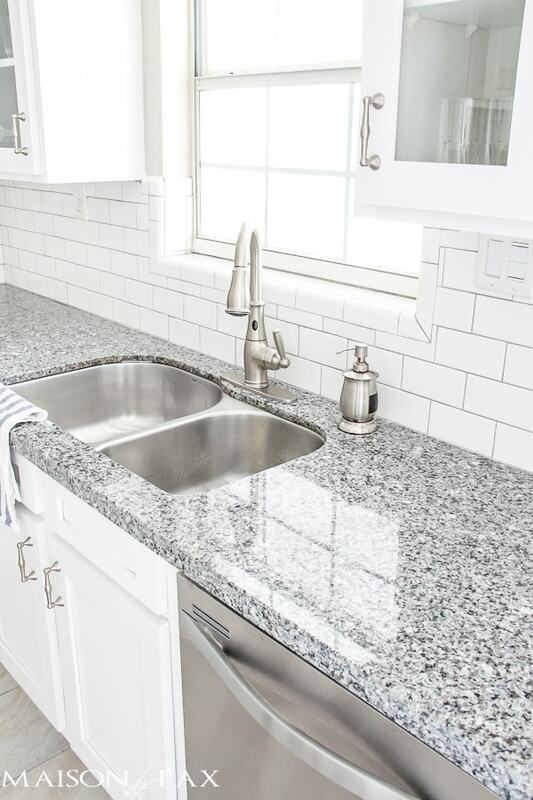 And as one of the more affordable granites available (at least in our part of the country), it was a great option for natural stone at a reasonable price. #12. Keep what you can. They may not be the fanciest or the most beautiful microwave, oven, and cooktop, but they are already stainless and they work well. The cost of replacing them all (especially because the oven is a peculiar size) simply didn’t make sense. 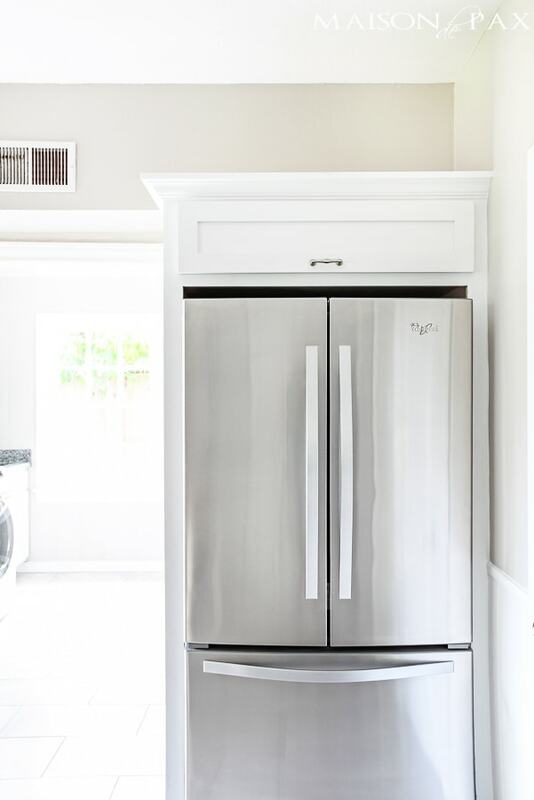 Taking a cue from #9 (balancing splurges and budget buys), by replacing other appliances, the whole kitchen gets a fresh look even with these same ones. #13. Know what to DIY and what to outsource. #14. Take it in stages. This wasn’t an option for us this time (because we needed to sell the house and join Mr Pax), but do try to consider where you can logically take your time. Some things just don’t make sense. There is no point in replacing the cabinet doors and painting them all later – that just makes you pack away your kitchen twice. Ugh. 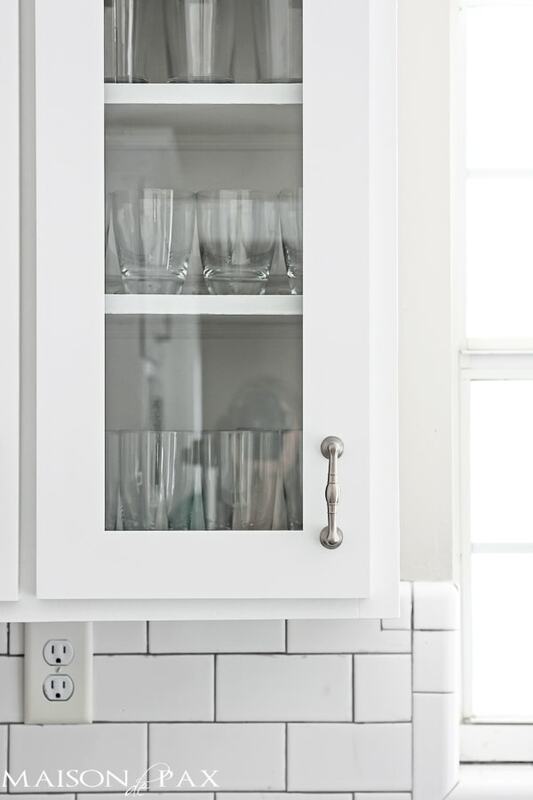 But you certainly could reface your existing cabinets and then take your time building a fridge cabinet. Or wait until you find that budget-friendly light fixture you love; there’s no law saying it has to be replaced at the same time as the floors. Feeling the need to do everything at once can sometimes lead to hasty, expensive choices. So slow down, take your time, and only spend what you should at the moment. I hope these tips helped! Remember, you can find a full source list for the kitchen here. If you have any other questions, don’t hesitate to ask! Looking back? My only regret is that we didn’t do these renovations sooner and have more time to enjoy them before we sold the house. Saving money doesn’t mean you have to sacrifice aesthetics or function. Disclosure: This post contain affiliate links. You don’t pay a penny more; I just earn a small commission to fund my remodeling habit. 😉 You can see my full disclosure policy here. I’m going to be needing every one of these tips someday! Thanks for the awesome post! 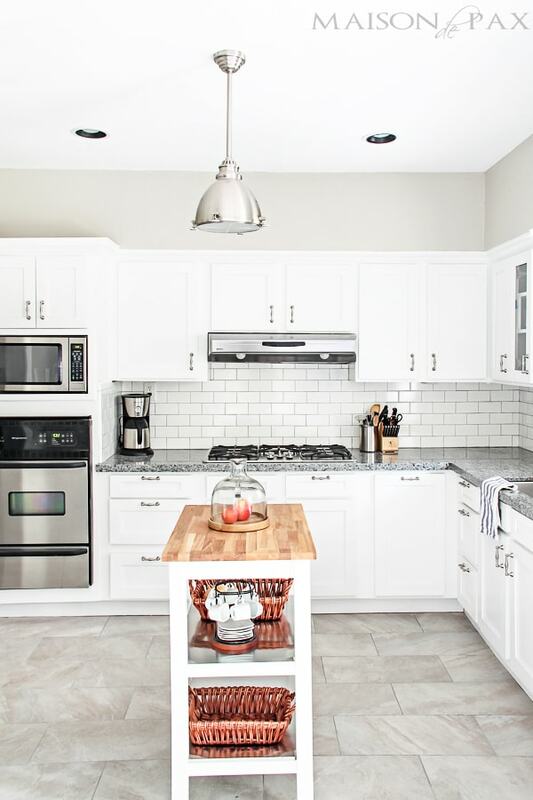 Have you shared how much this renovation cost you in total? My husband and I are debating renovating a kitchen with cash and are trying to figure out what’s a reasonable budget. I think we ended up spending between 11 and 12, Andrea; that included the work in the kitchen and the large attached laundry room. Like I said, though, because of our move, we didn’t have time to shop around or wait for sales. I actually found the countertops quite a bit cheaper elsewhere, for example, but they couldn’t install them until 3 weeks after we were supposed to have the house on the market. So our actual number is probably higher than it would have been if we had had a little more time. I hope that helps! Hi! I am having a difficult time finding affordable tile that I like, but I love this! What color grout did you use? Thank you, Danielle! So glad you like it. I believe the grout was called Delorean Gray (from home depot). You can see a full source list with links here. Hope this helps! 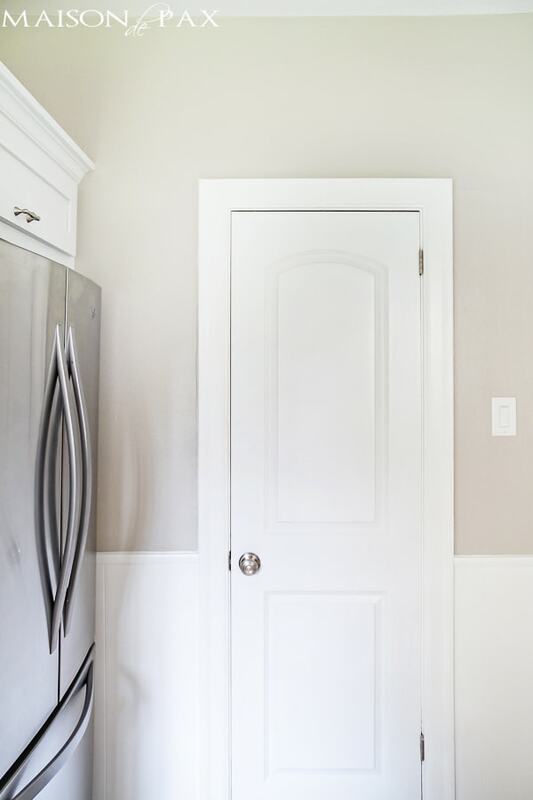 Question regarding the fridge door – do you have enough room to open it into the wall? I would very much like to build in my similar fridge like yours, but I’m concerned about the space constraints. 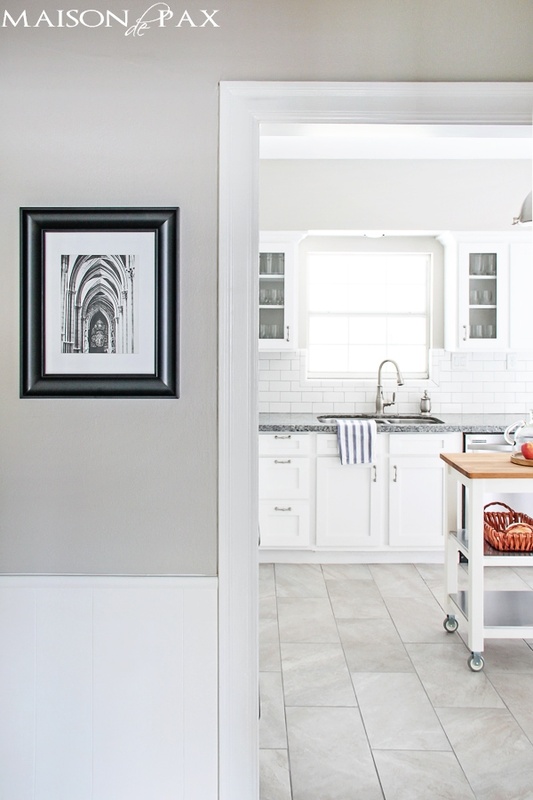 It’s a gorgeous remodel, and I love that it’s a realistic kitchen. Great question, Vicki. We felt there was plenty of room, but it helped that we had a french door style fridge, so we didn’t need to go much past 90 degrees to be able to get things in and out. We have actually since moved, so I can’t even reexamine for you, but I never felt it was a problem that I recall. I hope this helps! Thank you so much! It’s Colonnade Gray by Sherwin Williams. I’m so glad you like it! Love your choices it’s beautiful. What is the lovely shade of paint on the walls? i love it! Great post! Would like to know what the flooring was called. You can find links to all the sources here. Hope this helps! It’s Delorean Gray from Home Depot. You can find a link to the exact product and all the sources in this post. Hope this helps! 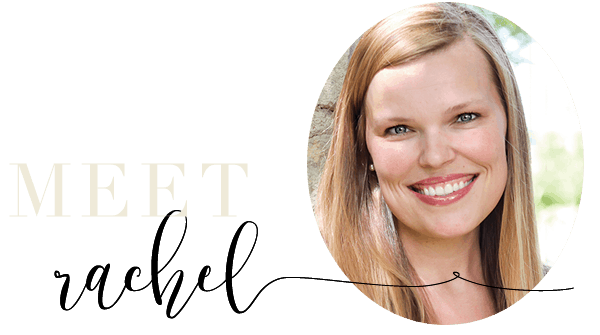 Hi, Rachel. 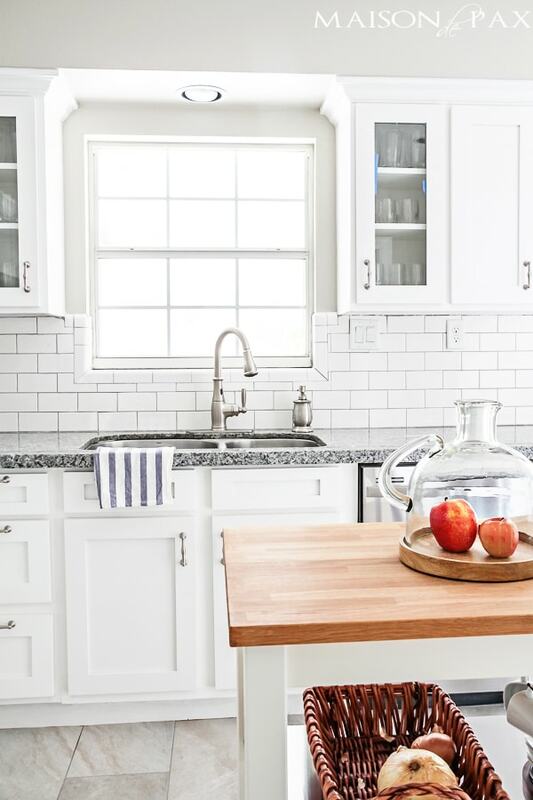 What if refacing isn’t an option for cabinetry. Do you have a high-end looking brand that you like, that won’t break the bank? 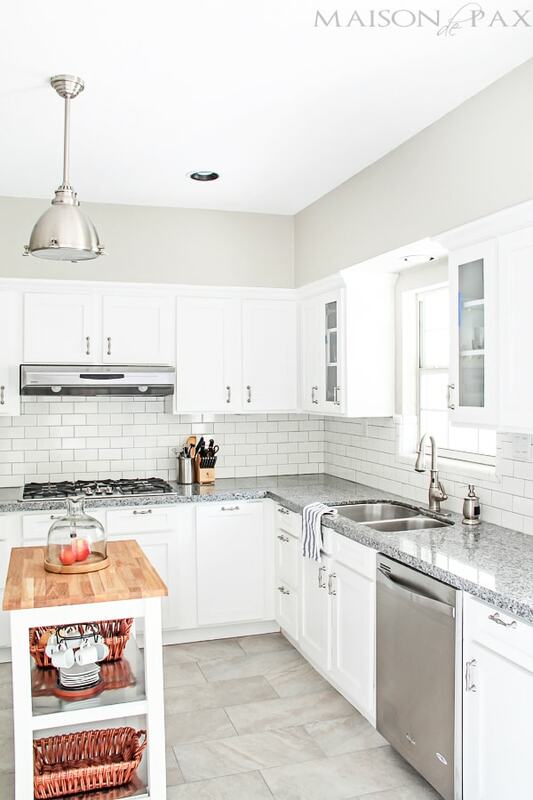 We’re buying a home with ugly blonde cabinetry, and I’m looking to redo the kitchen in white. Beautiful! What color did you use on the cabinets? Thanks! Thank you! It was actually just plain, untinted white (I think it’s called “Extra White” at Sherwin Williams? ).